It never should have come to the free kick they should have defended: James McFadden, ten minutes from time, should have knocked Kenny Miller’s cross into the wide open goal before him, giving Scotland the 2-1 lead and a fighting chance at victory. The free kick never should have been called: it was the Italian Chiellini who, in the eyes of everyone but the referee, clattered into Alan Hutton outside the Scotland box, and surrendered what should have been a free kick to the Scots. And the goal never should have been scored: Pirlo’s slow, high ball ought to have been dealt with, Christian Panucci ought to have been marked, and the routine header that won the game for the Italians should have been stifled before it began. But McFadden missed, Manuel Mejuto González got the crucial call wrong at the end, and Scotland’s defense crumbled, allowing Pirlo to float in the rainbow ball that ended one of the best stories of these Euro qualifiers and kept a deserving team out of the tournament. My most exciting moment in football this year was a goal I didn’t see. I couldn’t find a screen that would show me the Parc des Princes, and so most of Scotland’s win against France passed by with me trying and failing to watch it. By the time I found the game McFadden had already scored, and all that remained was the ragged, brave, desperate defense at the end, as the clearly overmatched Scots held on by the roughest conceivable form of inspiration. In fact, it was that visible tenacity, and not the goal I missed, that made the game so thrilling—a rebuke, I thought, to anyone who says that football must be dull when goals aren’t being scored, or that attacking play is the only place where the game is capable of beauty. The kind of joyful terror with which the Scots defended in those last twenty-odd minutes was as far as possible from a Brazilian highlight reel, but it was just as stirring to watch, and finally just as breathtaking. With the exception of the free kick that shouldn’t have been, it was precisely the same in the match today against Italy. If anything, it was a better overall performance from Scotland, who managed to dominate most of the game and produce several passages of spectacular set-up play without ever looking like they were in the same class as their World Cup-winning opponents. 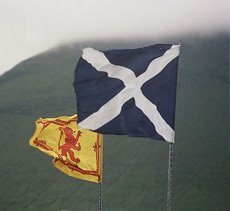 I’ve already heard some grumbling from people who are sick of hearing about the Scots and their so-called heroism; and I know how the media make us cynics, how hype makes us turn on our own responses, how we start to believe that any story that’s subjected to the swelling-strings treatment must be really unworthy or wrong. But to my mind the way this Scotland team played went right beneath all that. They played in a way that called up the real emotions of which the media are forever making forgeries. That’s why they deserved to play in the final, and why, taking nothing away from either Italy or France, it will be a poorer tournament without them. I feel for Scotland but I think your emotions on their exit has clouded the assessment of the game-Italy could and should have wrapped up the game in the first 15 minutes. Scotland took control of the game only after they scored an offside goal. There’s no doubt that Italy were the more talented team and that at their best they were better than the Scots on the day. But for long stretches of the match they played like they were cold; Scotland seemed to have the lion’s share of the possession throughout the middle of the match and created a few really good chances, like the goal McFadden missed. I’m not saying Italy didn’t deserve to win—they did. But given the talent disparity between the two teams, I thought Scotland still turned in a stirring performance. I agree. They did put Italy under loads of pressure and should really have taken the lead.